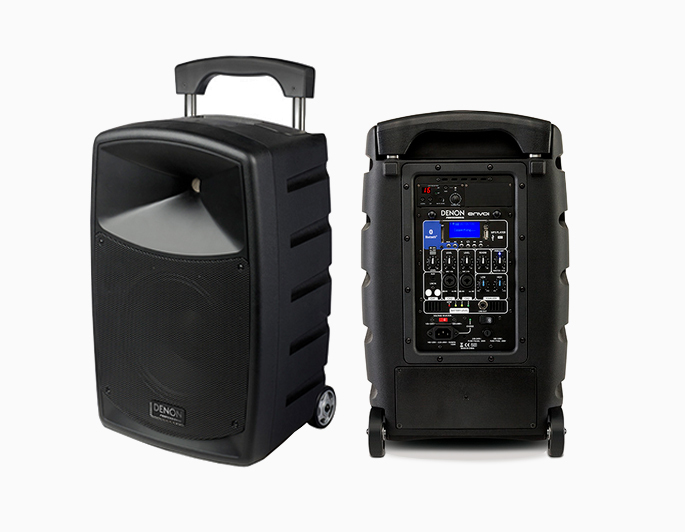 Providing audio for your next event just got a whole lot easier! The DENON ENVOI Portable Speaker System is a compact and easily transportable PA system that is AC or Battery-powered and features a built-in UHF wireless system with hand mic, Mic/Line 1&2 combo inputs, 1/8-inch (3.5mm) Aux Input, SD card reader, MP3 players (USB), and Bluetooth — with retractable handle and wheels. Perfect for wherever you have a need for clear high-fidelity sound — at outdoor events and ceremonies, business meetings, small musical ensembles, and more. Call Hollywood Sound at 323-466-2416 for a demo.